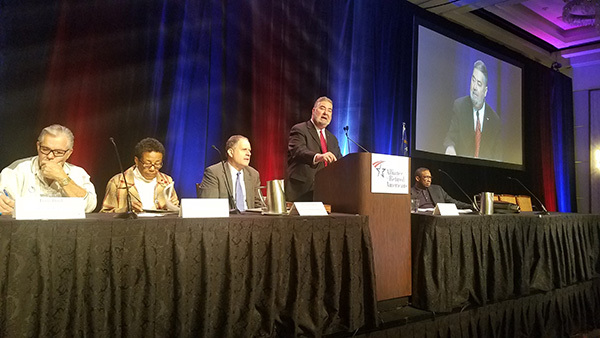 The Machinists Union is proud to fight for the dignified retirement of every working American, International President Bob Martinez told delegates at the Alliance for Retired Americans’ membership meeting in Las Vegas. Watch Martinez’s full remarks here. Martinez, who sits on the Alliance’s executive board, recalled former IAM International President George Kourpias, the founding president of the ARA. Former IAM General Secretary-Treasurer Robert Roach Jr. is the ARA’s current president. “Ever since the Alliance was born in 2001, the Machinists have been proud to stand by your side,” said Martinez. Martinez also addressed retirement security, including the IAM’s work to find solutions to fund insolvent multiemployer pension plans and avert a looming retirement crisis for millions of Americans. “The government did not hesitate to bail out Wall Street. Now it is time to help Main Street,” said Martinez. The Alliance for Retired Americans is a nationwide grassroots organization with more than 4.3 million members working together to make their voices heard in the laws, policies, politics, and institutions that shape American life.